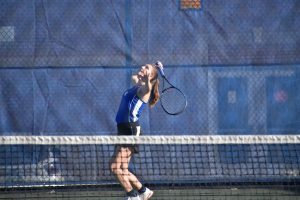 NOLENSVILLE – Wilson Central senior Kaylee Wilson has only lost two matches between singles and doubles this season. 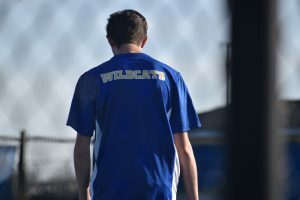 Like most athletes who show improvement from one season to the next, Wilson learned how to better compete on the tennis court – by running cross country this past fall. 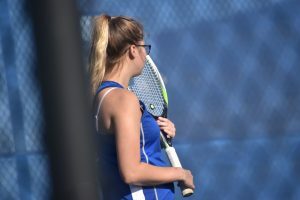 In Wilson’s first-ever season running for Wilson Central, the senior was a top two runner for the Lady Wildcats and helped lead her squad to the regional tournament. 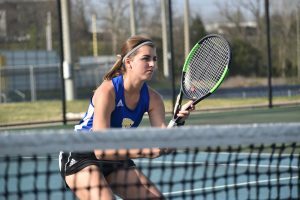 Wilson picked up an 8-1 win in singles along with an 8-1 victory in doubles with partner and fellow senior Makayla Posey to help pace Wilson Central to a 9-0 win over Nolensville on Tuesday afternoon. The cross country season taught Wilson a lot about herself in terms of competing against others, and even competing against herself. “Running cross country helped me a lot because of the competitive nature of running,” Wilson said. 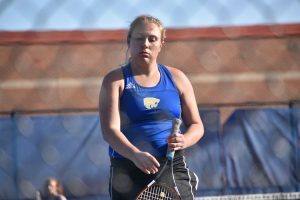 Wilson Central (10-1) had little trouble out of the gates with the Lady Wildcats dominating the singles portion of play. Senior Savannah Westbrook opened the match with an 8-2 win over Maddie Bridges at No. 1 singles. 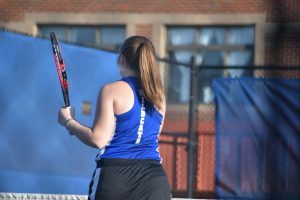 The Lady Wildcats picked up its next two wins with senior Sydney Miller handling Audrey McGowan 8-4 in two singles followed by senior Abby Moser’s 8-5 win over Rylee Horne at No. 3 singles. 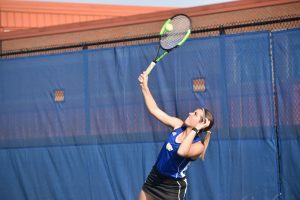 Junior Kiersten Moss gave Wilson Central its fourth point with an 8-1 win over Abbie Hageman at four singles, and Posey clinched the match with an 8-1 outcome over Ivona Manovic. “This team has been a lot of fun, and the season has been great as well,” Wilson said. Miller and Westbrook downed Bridges and Kaitlyn Sizelove 8-2 at one doubles followed by Moser and Moss’ 8-4 victory over Horne and McGowan. 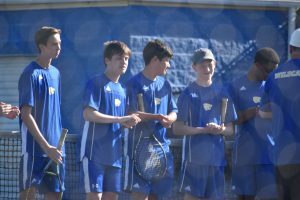 Wilson Central boys’ squad dropped a 5-4 decision to Nolensville. 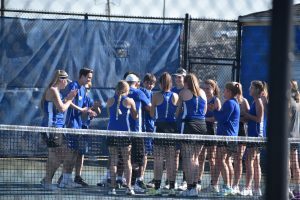 The Wildcats lost four for the six singles matches to open play which proved to be the difference. 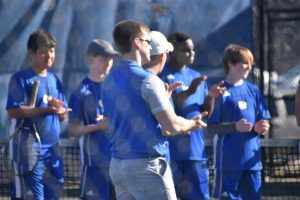 Wilson Central (6-5) fell behind early with Nolensville’s Jackson Vaughan defeating senior Michael Mercante 8-0 at one singles. Nolensville’s Will Riddle downed sophomore AJ Hughes 8-3 at No. 2 singles, and the Knights claimed the four singles spot with Zach DiCarlo claiming an 8-2 win over freshman Blaine Smith. Wilson Central got on the board at No. 2 and No. 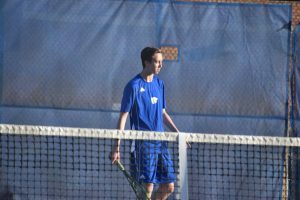 5 singles with freshman Sean Brown ousting Garrett Smith 8-2, while sophomore Caleb Brown earned a 8-5 win over Ian Bridges. 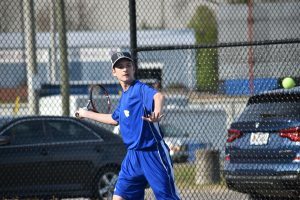 Wildcat freshman Charlie Ewing fell to Nolensville’s Chase Thomson 8-3 at No. 6 singles. Hughes and Mercante fought well, but fell to Riddle and Vaughan 8-5 in at No. 1 doubles. 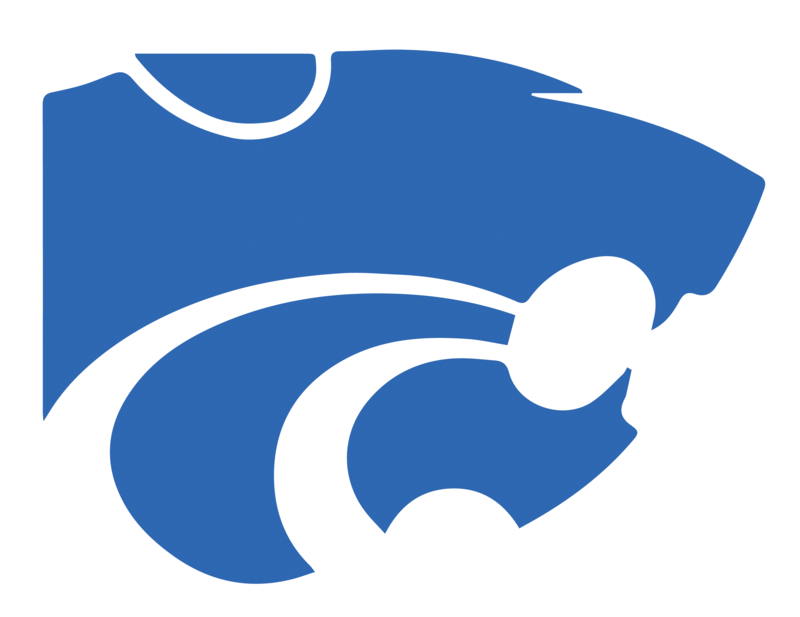 Wilson Central picked up a pair of wins at No. 2 and 3 doubles with Sean Brown and Smith taking an 8-4 win over Bridges and DiCarlo followed by Caleb Brown and Ewing handling Smith and Thomson 8-3. “We are having a hard time firing on all cylinders right now,” Wilson Central coach Ryan Jent said. 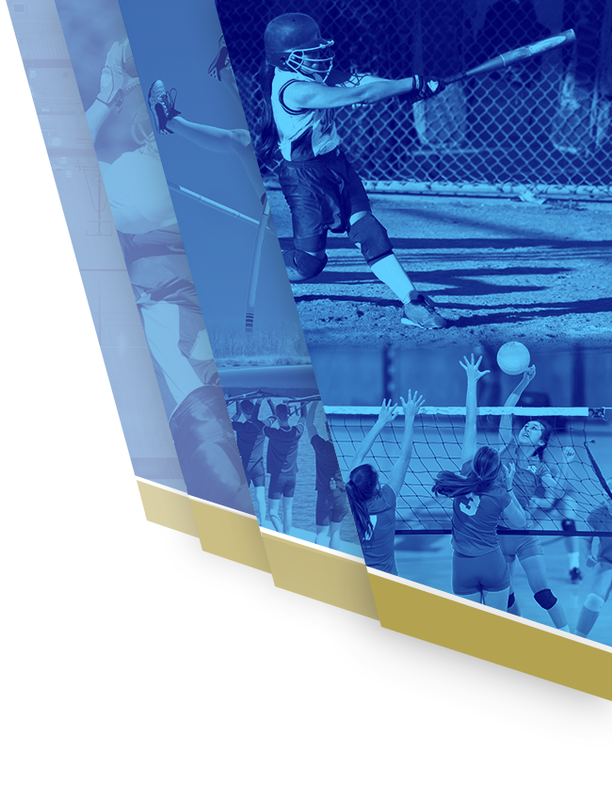 Wilson Central closes the week with a pair of District 9-Large home matches. 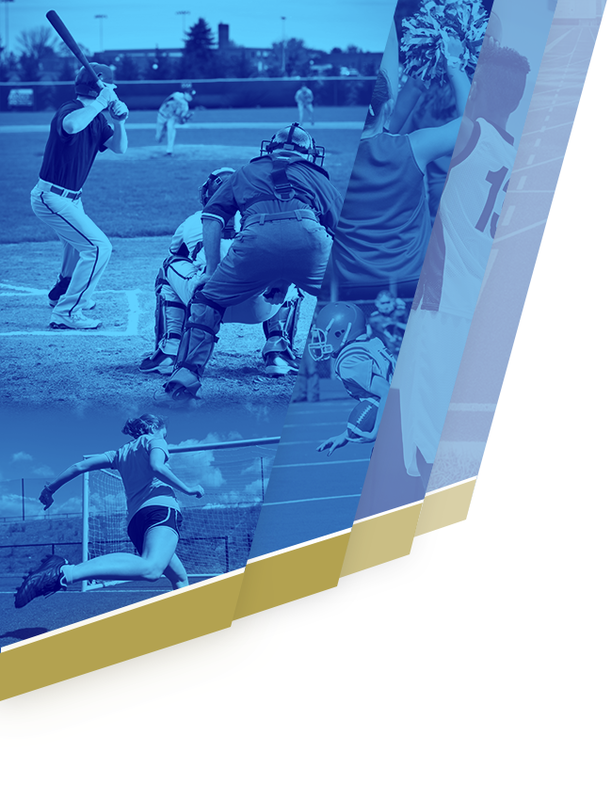 The Wildcats play host to Gallatin on Wednesday, and will entertain Greenbrier on Thursday. Both match times are slated for a 3:30 start.